SMALL KUCING: Do You Buy Online? Mamarazzi's camera batteries were going kaput and she spotted a good deal in one of the online discount site. 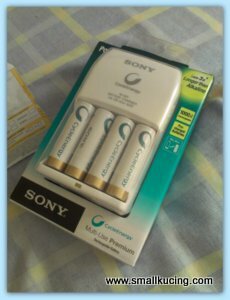 Hence she bought a set of Sony Batteries with charger. The terms was that the product would be ship out after a certain date and it should reach the recipient within 10 days. Mamarazzi waited and waited. On the 12th day, she e-mailed the company. It shocked her when received reply from the company that the product had been shipped out and was delivered. WHAT!?? Kaldip?? Who the heck is Kaldip? We don't have anyone by the name of Kaldip in our home. And on the date of delivery, Mamarazzi was home. Why nobody press the door bell? Of course ler, Mamarazzi immediately fire out an e-mail to the said company letting them know that she had not received the product and doesn't know any neighbour nor any "Sek Q" by that name. Any, Mamarazzi is glad to report that after investigation and some ding-dong, the company had sent a replacement unit to Mamarazzi. But this bring up the question, who the heck is this Kaldip? Parcel obviously not for her, why she so kiasu go and accept. And how can a reputable courier company simply release the parcel to a third party just like that without any authorisation from the parcel owner? And it is obvious that the parcel is not meant for KALDIP as from the name the person is of Punjabi or Indian heritage while the name on the parcel is clearing a Chinese name. I wonder in such cases, would the courier company compensate the sender? Whoaaa! You just scared me like hell.. Recently I ordered few items from Groupon! I hope Kaldip won't take my things! Oh please Kaldip, don't!! I will chop Kaldip's ambulance head if he take my stuffs! Kaldip... don't accept my stuff either! not from Groupon la, TM and Lina. I don't usually buy online. But I do buy through the phone or fax. Aiyoyoyo... ini not the online company's fault...ini the courier company's fault... suka suka let other people sign and simply release parcel. Mebbe ur not at home, din bother to call, den they simply kasi orang sign and relase, and say job son, can lepas tangan! the funny thing is Mamarazzi was home at the at the delivery time stated there. This is one reason why I don't shop or do anything like that online. Very stressful, so worrying. Only buy air ticket...and even that, half my life gone when doing the booking! Old man mah! LOL!!! entah la. That would be their problem to rectify. Wahh..like that, risky also, hor? I think the courier company doesnt tally the name to the recipient one, unlike the post office... anyone can take as long as the IC is there. Wonder whether they claim back from this K or not.. Rugi macam tu.. I malas go shopping one, so I purchase online quite often. The recent purchase from an online discount company took forever to arrive. Have you got ur battery? I did online shopping a few times and quite happy with their service. Luckily they give u a replacement. One good thing about online is you can email them. No extra cost.....but just need time. It is bit risky to buy things online but sometimes the deal is so good and can't resist to buy it. At least you're getting a replacement... it could be way worse. Order dengan Shashinki no prob at all. Tapi saya pernah kena dulu macam ni tp itu fault Nationwide. Dia hantar pada orang lain so of course la saya tak dapat ganti barang sebab bukan salah seller tu. Then in your case Nationwide should compensate since their staff sent wrongly. Should be to the reciepient only. almost every online shop need to pay via online and pay thru credit card, which is making me so lame. wah but the company is good..
they just send a replacement by your complaint? no need to investigate? then who is Kaldip? actually I think they don't even check at all. Like when I get my register I just sign and put my IC number. i rarely buy online except for those air tickets and hotels and cinema tickets lah, because just print out the coupon and redeem by person on the spot mah..
those online merchandises more risky lor, because you pay and they will send.. first you have to worry if they will be sending, second you have to worry if things will reach you or not..
so far i have not bought anything from groupon yet, although i've been attracted to many good offers lah..
i think it's the courier that makes the mistake.. because they don't need to deliver to the addressee, as long as there is somebody who takes the delivery, their job is done..
maybe they just sent to the wrong address, and that Kaldip also blur and just take in the delivery lah.. i think no one's fault here, purely mistakes lah..
at least you are able to claim back your purchase then it's ok lah.. hopefully this is just a rare case and will not happen again..
i think they should have emailed us the tracking number so that we can trace onlin where the parcel has been right?? tu la...you always buy but no Kaldip. I bought a lot of stuff online, but i'm lucky that i'm yet to encounter such problem before. This could be the company issue, probably they issued a wrong name to the courier? I have never bought anything online, maybe still not up to there. Btw, I can't make it tomorrow, have an important meeting and sorry for that. I shop quite a lot online and haven't experienced this before. But I do sometimes accept courier parcels on my neighbours' behalf. That is, after the courier people have called and asked my neighbour for permission la. Some courier companies just wanna get their package delivered and get on with their live. I've experienced once when I wasn't home, the courier man called, asked for my IC and said he'll drop the item in my mail box.